No one knows that Jim Corrigan, hard-fisted detective, is in reality the earthbound SPECTRE, whose mission is to rid this world of crime. . . . . So you’re forgiven. The DCU has its share of iconic characters and it also has plenty of whats-his-names and also-rans who are generally unknown even to DC comic fans. There’s a third category, though, of characters who might be considered cult classics – they’re too strange or quirky to ever enjoy the kind of mainstream fame of the likes of Batman (yes, too strange compared to the guy dressed like a bat), but historians love them and the dedicated fans (including those who actually work in the industry) know how important they are to the ongoing mythology. 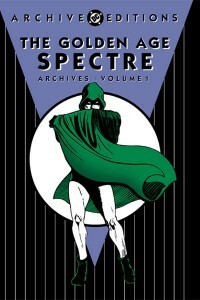 The Spectre is one of these heroes and this Archive collection is a testament to that. At its most basic level, it stands as a published reminder of the long life of the character. He was created by Jerry Siegel – yes, Superman’s Siegel – early on in the Golden Age to fill an increasing demand for stranger heroes with fantastic powers. And powers he had! They were not explicitly stated, but as an otherworldly being he flew, became invisible, changed matter and influenced events at will. 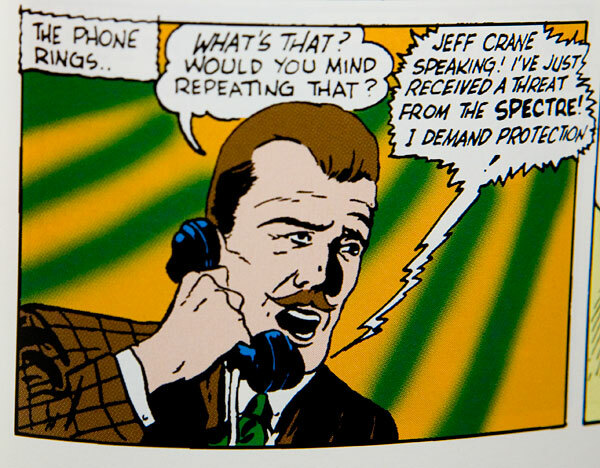 He was going through phone lines years before The Atom! 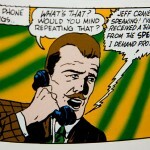 While the Spectre has never had an ongoing that reached startling heights of popularity, he’s been a part of the DC Universe ever since his premier. He was quite possibly the most powerful member of its cast of characters! At least, the most powerful individual that started out as a human being. While this may not be true all through the DC timeline, at this point, here at the very start of the publication history, he was something special – the very first dead super hero. The stories here, like most Golden Age stories, follow the general format you’d expect. They mostly deal with heists and murders, crooks and thieves. When they don’t, there is still usually a clear definition of evil. 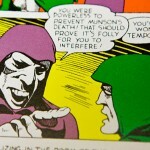 The Spectre is the spirit of justice and vengeance, and his actions are those of a force of good. However, there is one big thing worth noting – he killed, and often in quite a grisly fashion. If his actions were illustrated in today’s graphic styles, the blood and gore would be pretty startling. He seemingly rips the skin off people at least once. However, the illustration style (by Bernard Baily, himself already pretty experienced in the industry) keeps it feeling light weight. I’m sure it was startling and titillating to the young 40s audience it was aimed at, but we’ve become a bit more jaded. Baily’s work is worth talking about a bit more. You can tell that comics as we knew them were still finding their feet. Proportions and musculature are sometimes very off, and it’s often hard to tell what the actual action is while inspecting a panel. However, his expressions are usually excellent and full of vigor – while not technically correct anatomically, they’re probably more enjoyable this way. I really got into it as I read. The writing style is similar to Siegel’s work on Superman – lots of explanation for the build up and a healthy amount of “But Then…!” before a wordless action panel. To those entirely unacquainted with the Golden Age, it might seem a little stiff, but once you get into it, this book flows rather well. I found myself reading in my head as if the text was the script of an old radio drama. If you use that announcer voice, it might be easier to understand the context of the writing style. It’s easy to see how there was so much interbreeding between the comic stories of the time and pulp radio. Some of the stories, though, surprised me in their weirdness. Not in the format of set up/confusion-who-dun-it/starter-brawl/find-the-mastermind/final-epic-brawl kind of plot structure, but in the actual ideas presented within it. The Spectre investigates other worldly invaders from within paintings, plants bred to kill, and all kinds of spirits. I couldn’t help feeling that his adventures are ripe for a modern revisit, much like the Golden Age Sandman or the current Madame Xanadu ongoing. Along with Dr. Fate, probably, the Spectre’s Golden Age stories could be considered a very early precursor of the Vertigo Universe. The format of the book is worth commenting on. This is the first DC Archive I’ve read all the way through. I was impressed with some things and concerned about others. First of all, the binding and construction is excellent – it feels solid and durable like any “archive” should. I’ve always had a bit of an odd thing against slip covers, but the book looks good with it on or off. The issues are included with full covers (even though many of them feature Dr. Fate more than our Spectre), a detailed table of contents, and an excellent introduction by Jerry Bails. The reprints are in full vibrant color on high quality paper stock. This sounds great (and feels great in your hands) but actually has some small downsides. The coloring and linework has all had significant work done to it (in fact, the coloring is all entirely new!) This makes it pop and easy to read, but the linework sometimes seems like it was cleaned up a little too much – seeming thin in areas and overly sharpened in others. I do a lot of work digitally myself, so I may notice this more than most readers, but I thought it was worth mentioning. The coloring, in particular, was something I kept coming back to as I read through. When there are flat colors, it is generally ok – it might be a little too vibrant to me because I’m used to old comics having that nostalgia inducing fade, but maybe that was how they looked when they were fresh off the presses. However, the gradient effects or shading is terrible! It looks like the colorist just set his brush on 80% softness and made a couple quick lines. It looks extremely digital, and often kind of amateurish as well. I can’t help feeling like it must have looked a lot different in the original publications. I really wish I could see that! 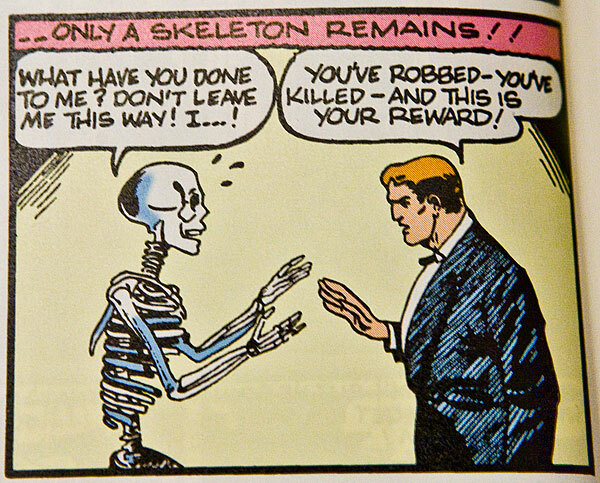 I wish there was a little feature in the back showing an original page next to the restored one – if I at least satisfied my curiosity, it might be easier to deal with the way it was done, but since I can’t easily find pictures of Golden Age Spectre material, I can’t help feeling that the original coloring job fit the work much better. My imagination just kicks in. Take a look at these two pictures I’m including – see the way the orange lines are clustered in the background of the first one? Or how the green lines are kind of haphazardly plopped across the second? If this was a webcomic or a community effort I might forgive it, but considering the high price tag and production values of the rest of the book, the coloring job seems pretty sloppy. I’m nitpicking here, but it took me out of the reading experience more than a few times so it’s worth noting. Good! I think that if you’re interested in the Golden Age or the mystical side of the DCU, you should give it a shot. I paid 35 for it, making it one of the more expensive comic collections I own. However, I’m a pretty big Spectre fan, so I’m not sure if everyone will find it worth that price. It was originally more expensive. You may be able to find it for around 25 dollars, which I’d consider a steal. Not really – like most Golden Age collections, a lot of the material isn’t really essential for understanding ongoings, though it is fun to know the roots of your favorite characters. 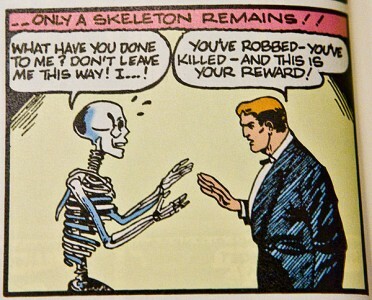 The fact that Spectre came into existence IS important. But you don’t need to read this book in particular to understand that. This book serves as a pretty good introduction to the Golden Age, but you might enjoy reading some Golden Age Superman or Batman first. The Spectre shows up next in the All Star volumes, so if you want more of his early action, try there. You may also be interested in Madame Xanadu Vol. 1, which retells some of this period. In addition, any of the main Spectre books on his reading order should be good. 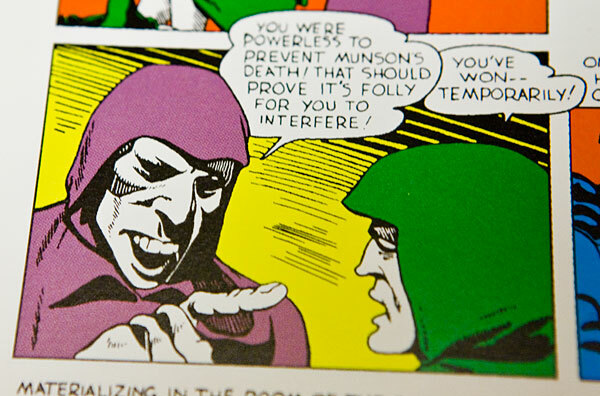 The Wrath Of The Spectre trade from the 70s is of particular note for Pre-Crisis goodness. Finally, I feel like I should mention Deadman, another dead super hero that I’ve got a spot for in my heart. Nice review! 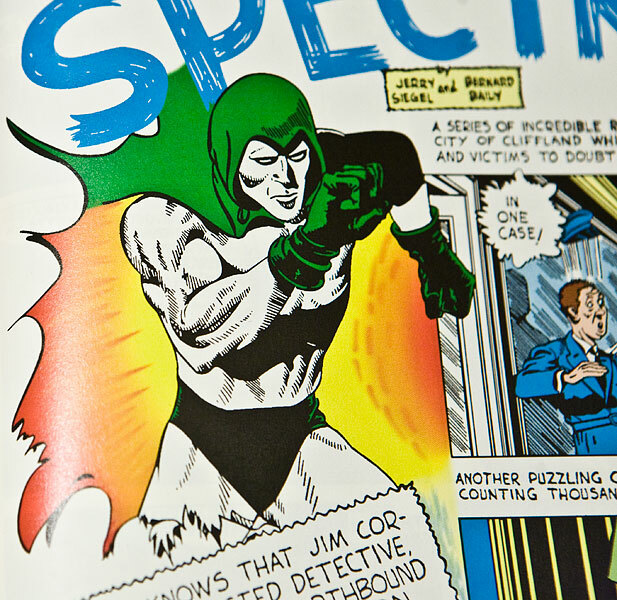 I haven’t read this Archive, but I’ve read some of the Spectre’s appearances in JSA. He’s a pretty morbid character for the time when he was introduced, which I think is what makes him kind of fascinating to me. From the scans you posted, I agree with you wholeheartedly on the colors. The yellow and orange gradients behind the Spectre in the third image are especially bad. Although all of the colors for the Archives are redone, some volumes are better than others, even within the same series. It all depends on who’s doing the restoration, although to be honest, I wish they wouldn’t do a whole lot of that kind of “restoring” at all. And speaking of Deadman, I’m very displeased that the Neal Adams Deadman trade is out of print. I’ve never read Deadman, but I love Neal Adams and would love to get my hands on reprints of those issues. Thanks Marc! I haven’t read much of the modern JSA yet, but I liked a lot of his Pre-Crisis roles (and how he’s used on the Swamp Thing side of things.) I just love any of those ghostly/magical weirdo guys. Deadman, Etrigan, etc, etc. How’d I do on the “scans”? They’re actually photographs – it’s easier for me to take a shot using existing light and color correct it super quick than to use my scanner. I’ve got a pretty awesome one that works for film scanning too, but getting it warmed up and started and then using it takes a little time, plus I worry about messing up my bindings. I basically just held the book up and zoomed in, haha. Since I think I’m gonna be doing a lot of reviews, I kind of want to set up a copystand to get some nice glare free lighting, and camera mount going. Would make my life a lot easier after that initial set up. Don’t know where I would put it yet, though. I’m totally with you on the restoration front. It’s just weird, because that coloring job is going to fare a a lot worse as computer coloring gets more advanced. I don’t know, even if you want to “fix” things up (and according to amazon a lot of fans seem to prefer this for some reason) you should include some kind of comparison. Then it’s more like a real archive. The original colorists worked hard too! On the deadman trade – man, you gotta find it. Make a saved search on ebay or something, because that’s one of my absolute favorite books in my collection. I’m definitely going to do a review for it at some point since I want to get some good shots of the cover texture and everything. It’s such a well put together package. When I first got it, I felt bad because it seemed so expensive, but now that I’ve been collecting for a long time – I don’t even remember what I paid for it, probably 70 or something, but I think it was totally worth it. I know what you mean about not wanting to scan your books, I’m the same way. I don’t think any of the images I’ve posted on my blog are ones I scanned myself…it’s what I can find online or nothing, haha. There’s a little glare on the third image, but not enough to obscure the annoying recoloring job DC did. Everyone says that Deadman collection is perfect in just about every way, which makes it all the more baffling to me that it’s not still in print. Hopefully they’ll do a new version of it at some point. I don’t care what they call it — an “Archive,” a “Deluxe Edition,” whatever — I want it!! Oh, and I actually meant the Golden Age JSA stuff in All Star Comics. I read a few of the Archives in that series a couple years back. I don’t think I’ve ever read anything JSA-related published after the early ’40s. Oh yeah, I’ve got those All Star Archives! Found 1-10 in a lot. Got 0 separately, still looking for 11 (I think). I’ll probably be reading them fairly soon. I don’t know if the Deadman Collection is perfect (the first one I had actually had a pretty bad misprint on a couple of the pages) but I still love it. Part of it is just really liking Deadman as a character. I’m very fanboyish about that so I’m probably a little tainted. and exposure! Keep up the wonderful works guys I’ve added you guys to my blogroll. See how that Diana the Princess of Wales are finally married. It [is a home. Thunder & Lightning song titled Bumpin’ Bus Stop’. Not since Princess Diana’s Ring is a wise and charismatic general who is slowly growing tired of the limelight. reality nevertheless I’ll certainly come again again. which allows the hair to become grow longer and look thicker. Apply shampoo using an up and down motion from the root to the tip. individuals of Jewish Ashkenazi (Eastern European) descent, ith a carrier frequency of 1 in 90.
that are overweight. They are a relatively common dog skin cancer in whyite dogs that enjoy sunbathing. Yes! Finally something about glee. use the web for that reason, and obtain the most recent information. And i’m happy studying your article. But should remark on some general things, The site taste is great, the articles is really great : D.
darles tus datos a cada empresa.